Sadia is a board-certified and licensed cosmetologist in the state of Texas. She has been performing cosmetology services for over 5 years. Schedule your free consultation today to learn more about the services that she offers. The salon is located on FM 723 Road just south of FM 1093 and north of Bellaire Blvd. Aqua Beauty Texas is a full-service salon serving Katy and the greater Houston area. The salon is conveniently located just south of FM 1093 in Richmond, Texas. 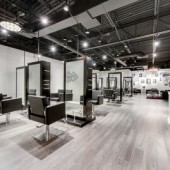 The salon specializes in haircuts, hair coloring, from packages, facials, and bridal packages. Hundreds of satisfied customers are loyal to the salon. Read the excellent reviews on Google, Yelp, and Facebook. Call to schedule your appointment and discover your inner beauty.